The climate of each region is crucial for the development and the overall performance of a place. 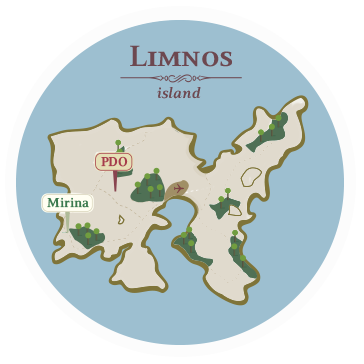 Limnos is a volcanic island with rare geological formations and rocky masses, and it also has one of the richest ecosystems in Europe. It is a particularly productive place with a microclimate-terroir unique for the North Aegean region, which, combined with tradition and the human element, is the island’s most important characteristic for exceptional products. Some of the most significant products of Limnos are cheese and dairy products, flour and, of course, wines. Limnos is marked by intense winds, high average monthly duration of sunshine – 227,8 hours – which make complete maturation of grapes easier. Average precipitation is relatively low (474 mm/year), although the existence of weak precipitations during summer, combined with high relative humidity (71%) give to the plant the necessary water for its development. Its average annual temperature is one of the lowest for Greek islands, while the average maximum temperature during the months of July and August is 29 and 28,3 Celsius degrees respectively, which avoids causing extreme heatwave conditions. In addition, the lack of high slopes and the soil’s absorbance create the proper conditions for the existence of humidity available during the months of summer. Vineyards are cultivated from sea level and up to approximately 300 meters above it.